It should be noted that there is a controversy associated with an oft cited book by Arthur L. Waldo titled “Jamestown True Heroes”. Challenges to one part of the Waldo book have often been used to try to minimize the contribution of Poles to the survival of Jamestown. That is the validity of one of its Waldo’s major references. It is the work of a Zbigniew Stefański who is said to be one of the five Poles who came to Jamestown in 1608. The controversy revolves around the following which is summarized by Peter Obst in an article published in fall-winter 2012 issue of Polish Heritage which is a semi-annual publication of the American Council for Polish Culture. “These and other fascinating details can be traced to Arthur Waldo, a publicist, who according to his own writings, had access to an unique book “A Merchant’s Memoir” (Pamietni Handlowca, Amsterdam 1624) supposedly written in “old Polish” by Zbigniew Stefanski, a glass maker and member of the original group of craftsmen. The book, found in war torn France, was offered for sale in 1947 to Mieczyslaw Haiman, director of the Polish Museum in Chicago. At that time Haiman was unable to raise the $5000 being asked. Before the book was returned and disappeared, Haiman dictated and Waldo copied out text for his “own information, not for publication.” Yet in the 1970s all these fragments appeared in Arthur Waldo’s book “True Heroes of Jamestown.” It was from Stefanski’s writings that Waldo obtained the names of the five individuals who constituted the Polish group. Later for the 350th anniversary of Jamestown’s founding, with support from the Polish Falcons, he placed a bronze plaque listing the names of the “First Poles in Jamestown” on the side of the visitor’s center located near the historic settlement site. Currently the plaque is in a different location, near a flagpole in the center’s parking lot. Some prominent scholars have attempted to locate the elusive “Merchant’s Memoir” but had no success. The absence of this primary source, which could clarify and solidify the Polish role at the settlement, has caused many serious historians to doubt Waldo’s veracity. Further complicating the situation was an article by historian, and director of the Pulaski Museum at Warka, Olgiert Puciata in POLAND magazine of August 1967 where he listed names different from Waldo’s as Jamestown’s Polish settlers — and gave no source at all”. While the original of the “Merchant’s Memoirs continues to elude search, whatever fragments are in Waldo’s book could certainly be subject to linguistic analysis of the sentence structure and the “old Polish” used to make an assessment of the likelihood of it having been written in the 17th century. This could go some distance toward resolving part of the controversy. Why is this issue so critical? Because the “Merchant’s Memoirs” paints the Poles as having been the “saviors of the English” because of the knowledge they had regarding basic skills, willingness to work etc. While the English are portrayed in a less then favorable light as incapable or unwilling to work in a way that would benefit Jamestown. It should be noted that this is an accurate portrayal of most of the English who were at Jamestown. Obviously this view of Poles as the “saviors of the English” at Jamestown irrespective of accuracy would not set well with individuals who have an anti-Polish agenda. In addition in the memoirs a group of Dutch/Germans who came over with the Poles are portrayed in a villainous light through their collaboration with the Indians against the interest often Jamestown settlers. Probably it did not help that Arthur Waldo was not a “professionally trained historian” as it is generally conceived. Consequently his writings were often dismissed out of hand by “professional historians/scholars”. Particularly, when his role in the Stefański “Merchant Memoirs” was publicized. Notwithstanding the issue of the Stefański memoirs the book “Jamestown True Heroes” does make for some very interesting reading and it does have a number of other relevant references. One of the attractive elements of the book is that it traces Polish and English mercantile trading relations back to the early 1400’s. As you might suspect mercantile relationships involved the very complex political history of Poles and English with Russia and Sweden and various German states. While the English were primarily located in the Gdańsk area, smaller groups of Polish Merchants and craftsmen could be found in London. The book continues with a detailed history of the Poles at Jamestown in particular the strike for the right to participate in the legislative discussions of what was becoming the Commonwealth of Virginia with its capital in Jamestown. Ultimately it deals with the effort after 1940 to gain recognition for the fact that Poles were important contributors to Jamestown and in turn to the development of the Commonwealth of Virginia. As was to be expected there was considerable resistance to the notion that the Poles played any significant role in the early development of Jamestown. Why Were Poles at Jamestown in the First Place? Important to understanding why there would be Poles at Jamestown in the first place can be traced to the fact that Captain John Smith (1580-1631 also of Pocahontas fame) did spend a brief period of time in the Polish-Lithuanian Commonwealth about 1602. (Smith who was a military person escaped from a Turkish nobleman for whom he was a slave as the result of capture by the Tatars in an earlier English related military action). Part of the route of his escape took him briefly into the Polish lands of the Polish-Lithuanian Commonwealth. Smith had a favorable impression of the Poles as a result of his brief experience in Poland. Captain Smith solicited Poles only after his initial assessment of the situation at Jamestown was so dire that he returned to England in order to get more English to come to Jamestown who would have the necessary skills to build the Jamestown colony. However those individuals were in demand in England and why would they leave a relatively comfortable existence to practice their trades across ocean in what was a primitive and hostile land? As the recruitment of English talent proved difficult Smith then turned to finding Poles who would serve a similar purpose. He was able to locate five who were willing to join him on his return voyage to Jamestown in 1608. If one then considers the dire situation at Jamestown in 1608 it becomes easy to understand why the Poles would have been extremely critical to the survival of Jamestown as many of the English there were more focused on finding gold and not in developing the colony. 1619- Poles Strike for the Right to Vote- Polish Position “No vote, no work”! 1619 The Poles engaged in strike for the right to participate in the legislative process of what would eventually become the Commonwealth of Virginia could be summed up in an equivalent of “No vote, no work”. If the Poles were irrelevant to the survival of Jamestown Colony then they would never have been able to leverage their position into full voting participation. The Poles at Jamestown were critical craftsmen. Artisans who had the knowledge, skills and work ethic necessary for the survival of the colony. The above point cannot be overstated as they and their spouses were most likely not native English speakers and they may have been at least nominally Roman Catholic at a time when England was recovering from its separation with Rome during the reign of Elizabeth. Consequently the right to vote was not some sort of “benevolent gift” for the Poles. It was extended because it was “demanded” by the Poles in exchange for skills and knowledge they possessed, a lesson which is still valid today in 2014. There is an excellent summary of the Polish experience at Jamestown on the Websites of the national Polish American Congress (PAC) as well as on some of the state divisions such of the Polish American Congress of Western New York. To access it simply type into Your browser: “Jamestown 1608 the Polish Pioneers” The title of the article is “The Role and Accomplishments of the Polish Pioneers in the Jamestown Colony”. The article was developed by three interns at the PAC’s Washington Office. They are: Joshua D. Holzhauer, Lucyna Berlinska-Padney and Katarzna Kielbasa. They used a number of references in addition to the book by Arthur Waldo. In Detroit we have number members of the Polish American Congress and the Friends of Polish Art (who are members of the American Council for Polish Culture). 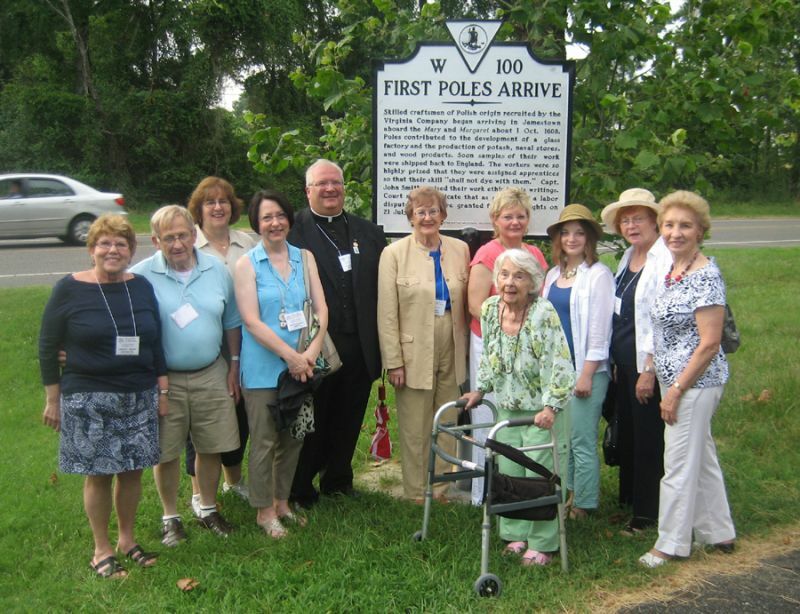 For example when there was an historical marker placed in 2012 near Jamestown commemorating the 1608 arrival of Poles there were was a very nice delegation from Detroit which consisted of Carolyn and Matt Meleski, Carol Surma, Evelyn Bachorski-Bowman, Msgr. Thomas Machalski, Henrietta Nowakowski, Anne Tyszka and her daughter Lydia Dyhdalo, Mary Ellen Tyszka, Jackie Kolowski and Halina Ujda. If I missed anyone please let me know and I will publish their names. Many of these same individuals will be involved in the 400th Commemoration of the Polish Jamestown strike for the right to vote in1619. I would like to encourage my readers to consider joining any of number of Polish organizations. For example the Friends of Polish Art and the Polish American Congress, Polish National Alliance, the Polish Falcons, American Polish Cultural Center and any of a number of outstanding Polish organizations in the Detroit area. If I have not mentioned your group send me a note and I will mention them in my next article. The Polish experience at Jamestown is important to remember and commemorate not simply because of its historical significance but also because in some ways it is a representative examples of the experience of Poles who have emigrated to the United States and their struggle for recognition both economically and politically particularly in the 19th and 20th centuries. We will have more to say about the 400th anniversary commemorations as the year 2019 comes closer.